Absurd doesn't even begin to describe the fight in the heavy-duty truck arena. Every year the gauntlet is thrown down by Ford, General Motors or Ram Trucks with either a redesigned model or improvements to the chassis and powertrain to make them the king of the hill. 2017 sees GM taking the spotlight with updated versions of the Chevrolet Silverado and GMC Sierra HD trucks. Mechanical changes are the big story GM has updated key parts for their Duramax V8 diesel to produce more power. Is it enough to put GM on top? 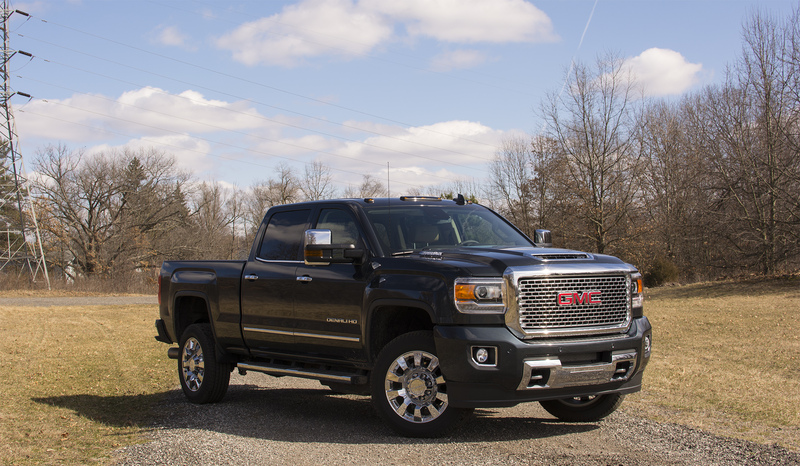 We spent some time with the 2017 GMC Sierra 2500HD Denali to find out. The Sierra 2500HD is already an imposing truck on the road. It looks like GMC's design staff chiseled it out from a block of granite with its squared-off body and muscular fenders. Opt for a diesel engine like our tester and you'll get a new hood with an integrated scoop. The Denali trim takes it a step further with a mesh grille insert, HID headlights, and a lot of chrome trim. For some, the amount of chrome featured on the Denali will be a turn-off. But at least the lower trims don't go overboard with the chrome. 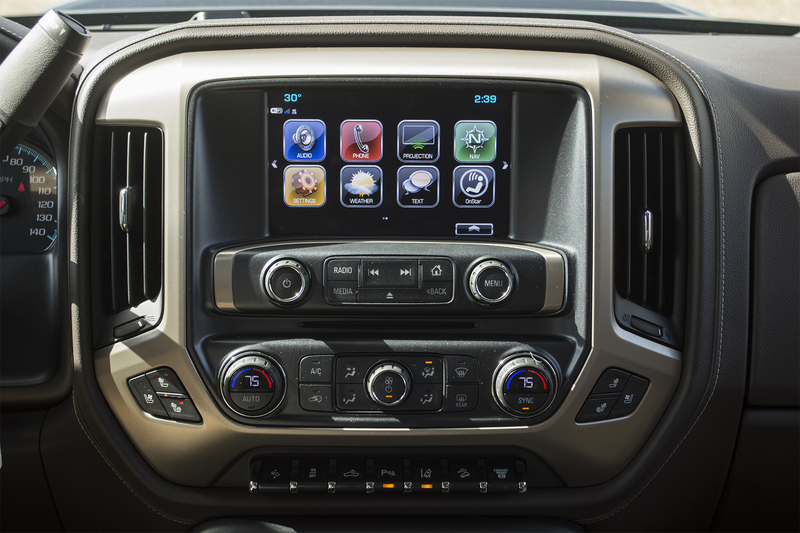 GMC has designed one of the most straightforward interiors in the heavy-duty truck class with the Sierra 2500HD. Step inside the 2500HD and you'll be impressed by the upright dash and logical layout of controls. We like the large knobs and buttons used throughout, as it makes it easy to control various systems when wearing work gloves. Thanks to a large number of trims on offer, you can get an interior to fit your needs. Whether you need a work truck that can withstand the harshness of the worksite or a luxury truck that can give luxury sedans a run for their money, GMC likely has a trim for you. The Denali sits on top of the Sierra lineup and features luxury touches such as leather upholstery, memory function for the driver's power seat, and a heated steering wheel. But considering the $70,000-plus price tag of our tester, the Denali doesn't feel as luxurious as it should. For example, it would have been nice if GMC could have used some wood or aluminum trim around the center stack instead of gray plastic. Seats in the Sierra 2500HD are possibly best-in-class. They offer a number of adjustments and excellent support for long trips. Back seat passengers will appreciate the large amount of head and legroom. Interestingly, the cushions for the back seat feel slightly softer than the ones used up front. There is a wide selection of infotainment systems on offer for the Sierra from a 4.2-inch color screen to our Denali tester's 8-inch IntelliLink system. Ever since IntelliLink was launched a few years ago, GM has been making constant improvements to improve the system's usability. Compared to when it first launched, IntelliLink in our test truck showed no issues in terms of performance or reliability. It was quick to respond whenever we changed radio stations or go to a different function. Apple CarPlay and Android Auto compatibility comes standard and makes IntelliLink that much stronger against the competition. Optional is OnStar 4G LTE with Wi-Fi that provides high-speed data connection for up to seven devices. There are no EPA fuel economy figures for the 2017 GMC Sierra 2500HD as it is exempt from fuel economy testing due to it being over a certain gross weight. We got an average of 15 mpg in mostly city driving. At the time of this writing, Consumer Reports and J.D. Power are still gathering data on the 2017 Sierra 2500HD before predicting reliability. But if history is an indicator, the Sierra 2500HD will go the distance. Both groups rate the 2500HD very high in terms of reliability. In J.D. Power's Initial Quality Study, the Sierra 2500HD scores Above Average. The Sierra 2500HD comes with a full set of airbags, traction control, stability control, tire pressure monitoring, a backup camera, three months of OnStar emergency services and roadside assistance, and Teen Driver that allows a parent to set up a special key to monitor the speed and distance traveled. Teen Driver also turns off the audio system till everyone in the vehicle buckles up and sets limits on speed and volume. Standard on Denali and optional on other Sierra trims is the Driver Alert Package that includes parking sensors, forward collision alert, lane departure warning and safety alert seat. Disappointingly, the Sierra 2500HD misses out on a number of active safety features such as blind-spot monitoring and adaptive cruise control. Ford's recently redesigned F-Series Super Duty trucks have these as an option. The National Highway Traffic Safety Administration (NHTSA) is the only group to the crash test the Sierra 2500HD. It earned an overall rating of four stars. The Sierra 2500HD's standard engine is a 6.0L V8 offering 360 horsepower and 380 pound-feet of torque, and pairs up with a 6-speed automatic. Our test truck had the optional 6.6L Duramax turbodiesel V8 that was updated for 2017. GM went over the engine with a fine-tooth comb and replaced many of engine internals to make it stronger and more powerful. There is also a new hood scoop for models equipped with the Duramax that improves engine cooling. The end result is 445 horsepower and 910 pound-feet of torque; increases of 48 and 145 respectively. To handle this newfound power, GM upgraded the 6-speed Allison automatic transmission with stronger internals and new electronics. Two-wheel drive is standard while 4-wheel drive is available as an option. 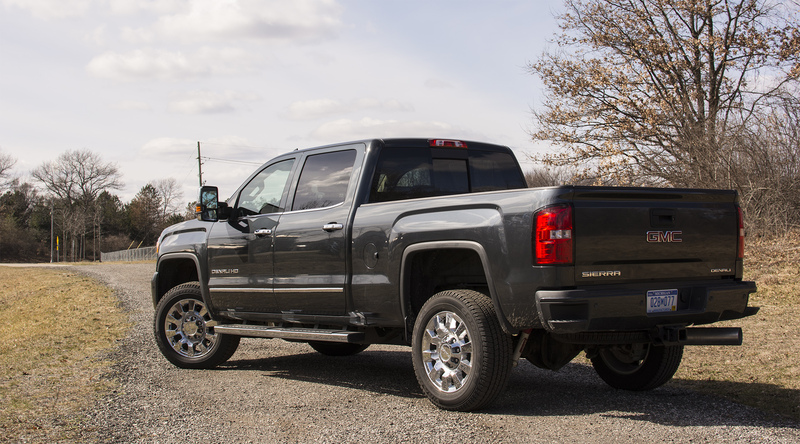 The updated Duramax moves the Sierra 2500HD with authority. Prod the throttle and all 910 pound-feet will throw you back in the seat in an instant. GMC says with the Duramax, the Sierra 2500HD can hit 60 mph in just over 7 seconds. Considering the crew cab version tips the scales at just over 6,500 pounds this is quite impressive. But this is surpassed by how much work has been put into limiting the amount of NVH coming inside the cabin. Some of the changes for the Duramax V8 include a new insulated oil pan to reduce noise levels. The changes make a difference as the Duramax quietly purrs at speed. There is still some diesel clatter when you start up the truck and when you slam the accelerator to the floor. The 6-speed Allison automatic goes about its business with smart and crisp shifts. For most heavy-duty truck buyers, the key numbers they are interested in are payload and towing. The Sierra 2500HD is no slouch in this regard. Our truck configuration - Crew Cab with a 6'6" bed Duramax V8 Diesel 4WD - is rated to carry a maximum payload of 2,943 lbs and can tow up to 13,000 lbs with a standard receiver hitch or 14,800 with a 5th wheel hitch. It should be noted that a comparable Ford F-250, when equipped with its optional PowerStoke diesel V8, beats the Sierra 2500HD with a max payload of 3,450 lbs and towing figures of 15,000 with a standard receiver hitch and 15,400 with a 5th wheel hitch. Unless you're planning to tow a barge or a space shuttle the Sierra's towing figures will satisfy. While the tow numbers trail one of its key competitors, the Sierra 2500HD fights back with a better ride. Compared to other heavy-duty trucks, the Sierra 2500HD doesn't exhibit the same level of bounciness or shaking when driving over a rough road. You will still feel a fair number of bumps through the seat, but this is mostly due to the way the Sierra 2500HD's suspension is set up to handle heavy loads. Like most heavy-duty trucks, the 2500HD's ride smooths out if you have a load in the bed. Steering is very light and will require a fair amount of correction when driving on the freeway. At least wind and road noise are kept to very quiet levels. The 2017 GMC Sierra 2500HD begins at $33,990 for a 2WD regular cab with the 6.0L V8. 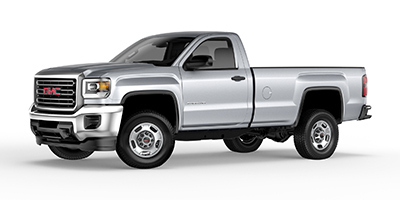 Our Denali Crew Cab tester starts at $58.495. With options, the as-tested price was $70,540. 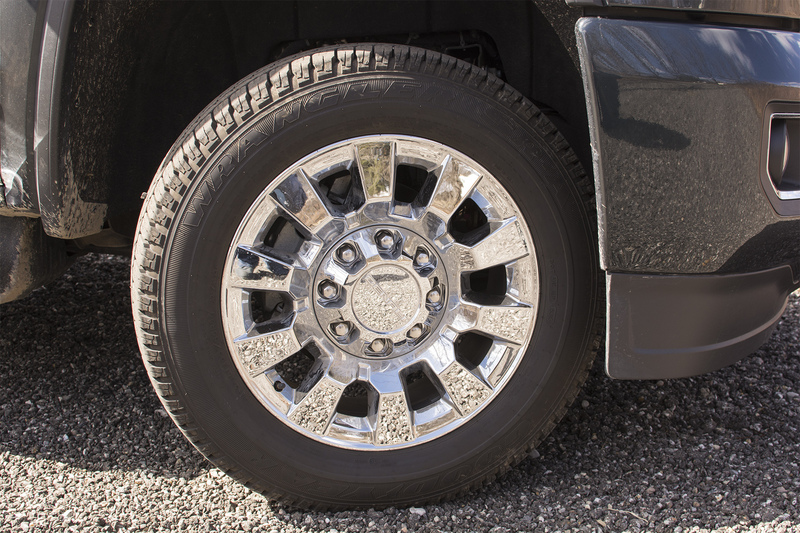 You may wince at the price, but it's the going rate for luxury heavy-duty trucks. It should also be noted that a fair chunk of the as-tested price comes from the Duramax V8 diesel, coming in at $9,550. For most buyers, we would say look at either the SLE or SLT trims. They offer a bit more variety in terms of cab and bed configurations - Denali only comes in the crew cab with a 6'6" bed. If you can stomach the price tag of the Duramax V8, go for it. Also, be sure to order Driver Alert Package as that nets you the parking sensors, forward collision alert and lane departure warning. Ford recently redesigned their F-Series Super Duty for the 2017 model year with the big story being its all-new aluminum body. As we noted, the Ford F-250 bests the Sierra 2500HD in hauling capability and offers more active safety equipment. Also, the top-line Platinum trim blows the Denali out of the water in terms of luxury features such as massaging front seats. The F-250 costs slightly less as well with a starting price tag of $32,535. But spec out a top-line F-250 comparable to our Denali and it will run you few more thousand dollars. Plus, the Sierra 2500HD beats the F-250 in ride quality. 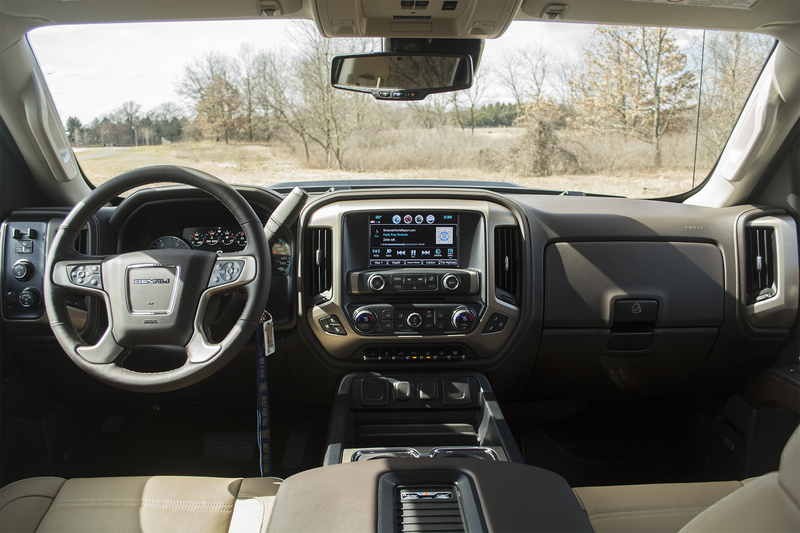 The Ram Truck 2500 does slightly better in terms of interior materials and features one of the easiest infotainment systems in the class. Plus, there is a wider range of trims on offer that gives you the ability to find the right truck. However, the Ram 2500 is beginning to show its age as the optional Cummins diesel engine isn't as quick or quiet as the Duramax. Also, the Ram 2500 trails the Sierra 2500HD in overall towing and hauling. As we said at the beginning, the heavy-duty truck has gone above absurd with truck manufacturers increasing power output and overall towing capacity to stand on top. While the GMC Sierra 2500HD may trail a key competitor in towing, it does everything else right. 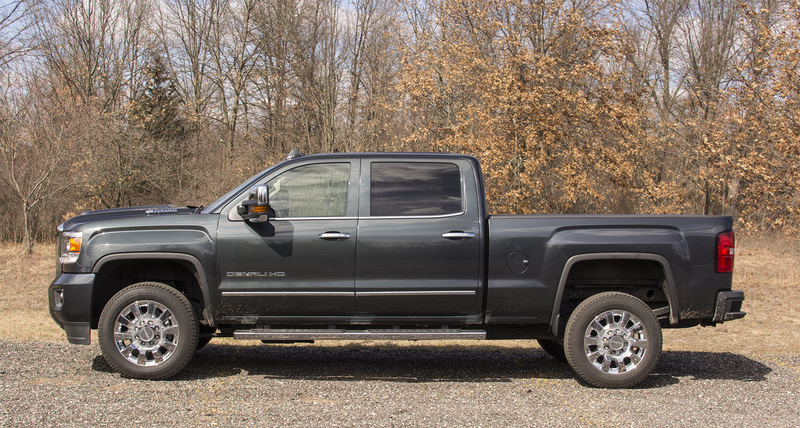 The updated Duramax makes the truck feel more like a hot rod and the mostly settled down nature of the suspension gives the Sierra 2500HD possibly the title of best-in-class for ride. The heavy-duty truck class is like three bowls of oatmeal in Goldilocks. One is too cold, one is too hot and one is just right. For most folks, the Sierra 2500HD is the "just right." Interested to see how the 2017 GMC Sierra 2500HD ranks against similar cars in terms of key attributes? Here are the 2017 GMC Sierra 2500HD rankings for MPG, horsepower, torque, leg room, head room, shoulder room, hip room and so forth.